Summer season. Grilling. Don’t want to heat up the kitchen any more than is necessary. So, when company is coming to town and dinner for ten is in order, and half of the guests don’t eat meat (but will eat fish), what’s the imperative? Why grilled salmon, of course! Have you ever grilled a big piece of salmon on a cedar plank? No? You haven’t lived. Juicy, smoky, crispy, full of flavor, and just rocking with Omega 3s (I just point that out because at my age I have to be careful just what I put in my body (LOL). The reality is, I don’t much like fish, any fish. Can’t say why; I never did like seafood beyond shellfish, but over the years I have learned to like salmon enough to find recipes that I can make and like. Like my friend Jim Coleman’s Mustard-crusted salmon with shallots and white wine. 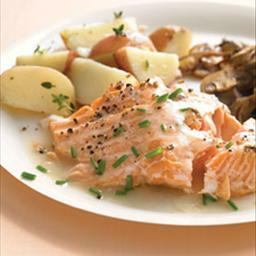 And wild salmon gently poached in white wine, pickling spices and black pepper with dill-yogurt sauce. And now, after experimenting with recipes and techniques, I’ve finally come up with a version of Seattle’s famous cedar-planked grilled salmon that I can say is worthy of my posting here (thanks, of course, to Cooks’ Illustrated, which, if you’ve read this space, know is my bible of cooking technique). Cedar-plank grilled salmon on the barbecue. I think it has changed my mind about fish. This is the best piece of fish I’ve ever eaten, and I’m happy to report that I actually made it myself. It’s slightly Asian in its feel, and it goes incredibly well with quick-sauteed spinach and garlic and a Thai version of my legendary (according to me) cold sesame noodle salad. So here is my latest adaptation of a published recipe, from Cooks Illustrated to my kitchen to yours. Soak the cedar plank for at least an hour in room-temperature water and 2 cups white wine. Fully submerge the plank in the water; weight down if necessary. Mix together the vinegar, oils, soy sauce, chives, ginger, and garlic in a 1-gallon zipper-close bag. Roll the salmon fillet small enough to fit into the bag. Zip the bag, turn it over a few times to mix and coat the salmon, and refrigerate for at least 15 minutes, up to but no more than an hour. Preheat an outdoor grill to medium heat. Place the plank on the grates. The plank is ready when it starts to smoke. 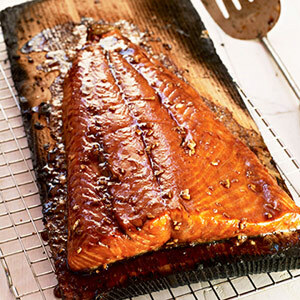 Place the salmon fillet in the plank and discard the bag and marinade. Close the cover and grill for 20-25 minutes, until the fish is done (when you can flake it with a fork). Remove the salmon from the grill, cover loosely with foil for 5 minutes, then cut into serving-size portions and serve immediately. You can make an extra half-batch of the marinade, set aside, and serve in small dipping bowls with the salmon. It is loaded with flavor. If you want the Thai version of the Sesame Noodles, search on this site for that recipe, then add 1/2 tablespoon fish sauce to the sauce recipe, and julienne broccoli stems, 1/4 cup chopped fresh basil leaves (Thai basil is best), and 2 tablespoons chopped fresh cilantro to the noodles before adding the sauce. It’s a nice change of pace, and will win raves. It’s Ellen’s birthday tomorrow (Monday, July 28). It’s also Jen Groff’s birthday (Friday, July 25). It’s a celebration. This auspicious occasion calls for something special. I need to produce a masterpiece. On several occasions E has suggested that her dream meal would be a seafood lasagna, and I have yet to produce such a dish. Jen’s here, and the rents (E’s parents) are here, the girls are here, and something special is required, and I’ve got just the ticket. I found this recipe at Cooking Light. As I am wont to do, I can’t leave well enough alone, because I think I know better. In this case, I think I’ve improved the on the original without upsetting the karma produced by it. It’s still light, following the dictum of Cooking light, but it tastes rich and creamy WITHOUT THE ADDITION OF BUTTER! That’s right…no butter in this dish, and if you follow the ingredients list carefully you will find that it is all that it ought to be without the butter. I’ve got to say, it looks incredible, and we will be tasting it in about an hour. I expect that I have hit the mark. I can usually tell if I’ve got it right, and I think I did so here. Try this recipe for yourself. Even though there will be several pots and bowls to wash, it’s relatively simple, and the aroma in the kitchen right now is absolutely off hook. Can’t wait to try this. I’d be interested to hear if any of you try this one, and how it came out for you. Mine looks like a home run. And as to the “shrinking” moniker? Just wait until you see how it shrinks in the pan as your guests ask for seconds. Old Bay or other seafood seasoning, to taste. Heat oil in a large nonstick skillet over medium heat. Add the mushrooms, onion, thyme, and 2 garlic cloves and cook 10 minutes, stirring occasionally. Add wine, bring to a boil; cook over low heat until the liquid almost evaporates. Remove from heat; stir in the crabmeat, and set aside. Peel and devein the shrimp, reserving shells. Cut each shrimp in half lengthwise; cover and refrigerate. Combine reserved shrimp shells, the clam juice and water, celery salt, and fennel seeds in a small saucepan. Bring to a boil; cook until reduced to 1 1/2 cups shrimp stock (about 15 minutes). Strain stock through a sieve into a bowl; discard solids and set aside. Combine the feta or goat cheese, cottage cheese, basil, lemon juice, and 1 garlic clove; set aside. Lightly spoon flour into a dry measuring cup, and level with a knife. Place flour in a small saucepan; gradually add milk, stirring with a whisk. Stir in shrimp stock and bring to a boil. Reduce the heat to low and simmer 5 minutes or until thick. Remove from heat and stir in the Parmesan cheese. Spread 1/2 cup sauce in bottom of a 13 x 9-inch baking dish coated with cooking spray. Arrange 4 noodles, slightly overlapping, over sauce; top with one-third goat cheese mixture, one-third crab mixture, one-third shrimp, 2/3 cup sauce, and 2/3 cup mozzarella. Repeat layers twice, ending with mozzarella. Sprinkle the top with as much seafood seasoning as you like and a light dusting of paprika. Bake at 375° for 40 minutes or until lightly browned. Let stand 15 minutes. Sprinkle with freshly chopped parsley. Salmon Cakes Like You’ve NEVER Tasted! I’ve just had the absolute best salmon cake I’ve ever eaten in my life. But wait…this isn’t just any salmon cake. I’ll compare this to any crab cake I’ve ever had (I lived in Crabcake County, Maryland and vacation near the Chesapeake every summer), and I’ll stack this up against the best crab cake anyone has to offer. I’m telling you, put this baby between pieces of crusty Kaiser roll with fresh Boston Bibb, a thick slab of Jersey tomato, (maybe a thin slice of red onion?) and your favorite sauce (Tartar? Remoulade? Cocktail? Tzatziki?, take your pick—this time I went with a real horseradishy cocktail sauce, but I can’t wait to try it with a good Remoulade), and you may never go back to that pricey jumbo-lump again. It’s spicy, tangy, and wonderful, extremely accessible, and gluten-free to boot. It works almost as well with a good can of salmon as it would with a piece of poached salmon from Costco. Place the poached salmon or the drained canned salmon in a large bowl. Stir in green onions, capers, almond meal, Lemon-fennel sea salt, and black pepper; toss to mix well, breaking up the salmon into small pieces. Beat two eggs in a separate bowl, then add to the salmon and toss well. Heat 2 teaspoons olive oil and 1 teaspoon butter in a large heavy skillet. When the oil/butter is hot, shape the salmon into flat patties about 4 inches in diameter and ¾ inches thick, and place in the hot oil. Cook 7 minutes on the first side over medium heat without touching the patties, until they are lightly browned and starting to get firm. Add the remaining olive oil and butter, then turn the patties and cook on the second side until they are firm and browned on the second side, about 6 minutes untouched. Turn off the heat, prepare your roll with lettuce, tomato, and the sauce of your choice, and place the hot salmon cake on top. Cap the salmon cake with a bit more sauce, complete the sandwich, and serve with your favorite slaw and a cold beer. Or a cold glass of white. Full Disclosure: this recipe was adapted from one on the South-Beach recipe site Kalyn’s Kitchen (www.kalynskitchen.com), but it is better than that, but just as “South Beachy,” and I know South Beach just about as well as anyone. Combine ¼ cup coarse sea salt with 2 tablespoons toasted fennel seeds and 1 tablespoon dried lemon zest (Penzey’s, Spice Islands, or make your own). Keep in a pretty, airtight jar in your spice cupboard and use liberally on seafood or chicken. I had a plate of seafood risotto the other night at a restaurant that I had been avoiding for years. And it was memorable. Why had I been avoiding it? Location, looks from the outside, lack of vision, obstinance, who knows? It just didn’t feel right where it was. An Asian-fusion restaurant at the confluence of two major roads in Lancaster, PA, and the fact that the building looks like it hadn’t had the outside washed in years (the amount of car traffic passing by every day doesn’t help), plus my wife’s flat refusal to try the place. If there was ever a perfect example of “looks can be deceiving,” this place is it. Blue Pacific Sushi and Grill, at the confluence of Oregon Pike and Lititz Pike, in Manheim Township, Lancaster County. So I decided to try to either replicate the dish or make my own even better. But the idea of seafood risotto really rings happy in my ears, so I had to try one of my own. Here’s the result. Not exactly the same as Blue Pacific’s entree, but I’ll stand mine up against theirs (and anyone else’s) any day. It’s worth a try. 1. Peel the shrimp, place the shells, the celery salt, a bay leaf, the celery leaves and the clam juice in water, bring to a boil, reduce the heat and simmer, uncovered, for 30 minutes. Strain the solids out, put the stock back in the pot, cover, and keep warm. 2. Melt the butter in a large, heavy pot, add the onions and saute over medium heat until transparent, about 10 minutes. Do not brown. Add the rice and saute, stirring constantly, until it is transparent, 3-5 minutes. Don’t allow the rice to brown. Add the wine and cook, stirring constantly, until the wine is competely evaporated. Add 1/2 cup stock and stir until most of the stock is absorbed. Add the thyme and saffron and another 1/2 cup stock, stir until it is mostly evaporated, and repeat, adding 1/2 cup of stock at a time until the rice is almost al dente, 20-30 minutes. 3. 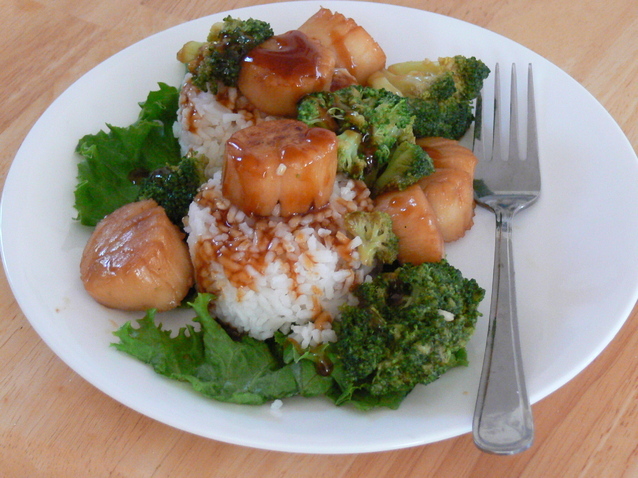 Add the seafood and 1/2 cup stock and stir until the shrimp and scallops are firm. and the stock has evaporated. Season with Old Bay or other Creole or seafood seasoning until you can taste it but the taste is not overpowering. Season with additional salt and pepper if necessary. 4. Add 1/2 cup stock to the pot, stir rapidly for 30 seconds, then ladle the risotto into oven-proof bowls, sprinkle lightly with Gruyere cheese, and place under the broiler just until the top and edges begin to brown. Remove from the oven, garnish with paprika and parsley, and serve immediately. Preheat the oven to 30 degrees. Sprinkle a large roasting pan with olive oil. Lay the salmon fillets in the pan with the skin side down. Spray the top side of the salmon with olive oil and season with salt. Roast until just cooked through, 20-30 minutes, depending on the thickness of the salmon. Dissolve the wasabi powder in 8 teaspoons water. Whisk into the sour cream and season to taste with salt. Add more wasabi if desired for flavor. Serve the salmon topped with wasabi sauce and garnished with chopped chives.